The Azden SMX-30: Handcrafted in Japan To Be the Ultimate Video Microphone. The SMX-30 Stereo-/Mono-Switchable Video Microphone from Azden is a battery-powered microphone with separate stereo- and shotgun-style microphone units that can be switched between mono and stereo recording modes. It can be used to produce pro-quality sound for DSLRs and other compact cameras in applications for interviews, weddings, presentations, and more. Housed inside an innovative casing, the SMX-30 is two microphones packaged into one. The stereo microphone is positioned at the top and consists of two cardioid polar patterns spaced apart at a 120° angle. The mono microphone uses a supercardioid polar pattern to focus on sound in front of the camera. It has the same high-quality element as Azden's SGM-250 shotgun microphone. Using the built-in +20 dB gain booster to get a strong clean audio signal into your camera, the SMX-30 minimizes the need to turn up noisy preamps usually associated with DSLRs, and also includes a -10 dB pad to protect against distortion when recording in loud environments such as live concerts and motorsport events. Furthermore, the microphone has a wide frequency response of 40 Hz to 20 kHz and has a full, natural sound. There is a low-cut filter switch for reducing low frequencies below 120 Hz, which is useful for mitigating noise caused by air conditioners, wind, and traffic. Powered by two AA batteries, you can operate the SMX-30 microphone for approximately 24 hours with no degradation of sound quality. The battery-indicator LED light lets you know when it's time to change batteries with up to a 1-hour warning beforehand. Finally, an integrated shock-absorbing shoe mount isolates the SMX-30 microphone from camera-motor/handling noise. The mount is designed to fit the standard camera shoe and comes with 1/4"-20 threads at the bottom for mounting to boom poles and other camera accessories. A foam windscreen and a carry pouch are also included. Box Dimensions (LxWxH) 10.7 x 7.6 x 3.3"
SMX-30 Stereo-/Mono-Switchable Video Microphone is rated 4.8 out of 5 by 20. Rated 5 out of 5 by Leon from Would I buy this product again? Absolutly! I liked the reviews, and the features of this Mic, so I thought I would try it, If not. then B&H has great customer return service, Well I used it on my Sony RX-10 MII, of which is a great camera, but weak on audio, especially on board Mic's. So, I did a simple 4-part test, I shot some video, Inside, & Outside with the RX-10's on board mic, and then with the Azden SMX-30. Like night & day! Better signal strength, richer sound, pretty well balanced, and when set to mono, it works just like a smaller shotgun mic, and the foam wind cheater was sufficient, but not perfect. I'm very happy with this purchase. Highly recommend it! Rated 5 out of 5 by BlueDrumStudio from Exactly the Microphone is was looking for, EXCELLENT! Needed to start filming events we host at the local American Legion in Newhall California. Called in to order an Audio Technica AT8024 but it was on back order. The B&H Tech suggested the Azden SMX-30; after only 1 event I really love it. Just got a Canon D7 MKii and the next day I shot an event. Check out my YouTude channel under BlueDrumStudio, and please forgive the focus issues as this was the very first time I used a DSLR. I didn't even change the camera preamp from AUTO, so what you are hearing is the Azden with the -10dDB setting while I walked in from of the live band. Rated 5 out of 5 by William Davis from Azden knocks it out of the park with this mic. Awesome!! I needed a mic for my Nikon D750 and I was considering the well known Rode VMP and then came across this, the Azden SMX-30. I didn't know Azden all that well but took a chance on the mic because it had such a cool look and has the versatility of stereo or mono. I do not regret this decision one bit!! This mic has fantastic sound. Having two mics in one is such a great feature. The build quality is excellent too. It has the 10 year warranty in case anything ever goes wrong - I feel confident this mic will last a me a long time. I am very happy with his purchase. Rated 5 out of 5 by Anonymous from Super low-noise microphone! I have been using the SMX-30 for months and have not experienced the background noise issue that Alex described. As a matter of fact, the SMX-30 is a very quiet mic that I have never noticed any noise. Probably Alex's experience has something to do with the fact that Panasonic HMC150 is not equipped with a 3.5mm mic input jack. When you have to use a 3.5mm-to-XLR adapter cable, especially involving a stereo to mono conversion, many things can happen. I think what Alex is experiencing is more of an adapter cable issue than a mic issue. Rated 5 out of 5 by Alan from Azden SMX-30 mic The unit is pleasantly compact and light-weight.The suspension is effective (compliant) & sturdy yet compact. Uses two, AA batteries that last about 24 hrs. Though this is significantly less run-time than most otherDSLR video mics on the market, the increased current draw is a direct consequence of the built-inlow-impedance pre-amplifier design. Lower impedance should yield a better signal-to-noise ratio.The easy to access battery door has a nice, sturdy (thick) design.The cord with a 3.5mm mini-jack is not too long (like many) nor too bulky (like one that is coiled).It is permanently mounted with good strain relief. Plug-in connections can be problematic. My audio is much improved and I really like being able to quickly & easily switch between shotgun & stereo with a minimum of equipment. Rated 5 out of 5 by Anonymous from THE Ultimate Video Microphone!!! 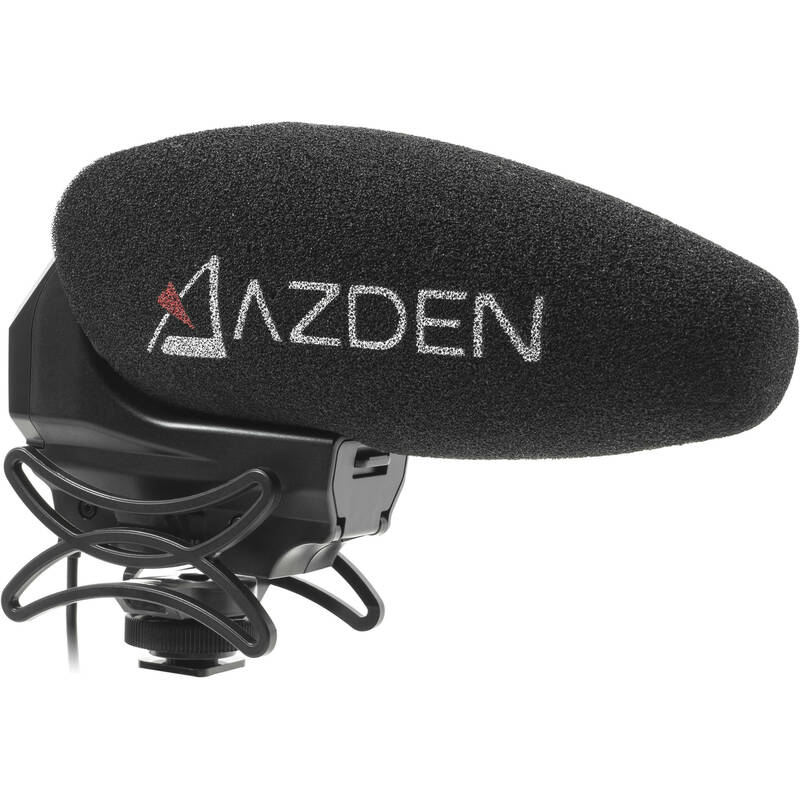 I had known Azden as a manufacturer of microphones great in build quality but mediocre in performance. But their SMX-30 just blew me away. Its stereo/mono switchable feature is not a gimmick, it actually works very well. It's like carrying 2 really good mics in 1 and each mode sounds as good as, if not better than mics from other top brands. I think Azden did a great job by designing the stereo unit on top of the shotgun unit. This way, the stereo mic will not pick up the motor noise from the camera which can be a serious problem with some stereo video mics. I also like the SMX-30's aggressive low-cut filter. Many mics feature a low-cut filter but it is rare that the cut is aggressive enough that it actually works. This is not as important as its high performance level and rich feature set, but I personally think this mic looks really great on my camera. Rated 5 out of 5 by Ron from B&H to the rescue with the Azden smx-30 I really like it a lot. I was thinking about the rode mic but the audio guy asked if I had researched the smx-30 . I did and called back and bought it. Great sound and I like the stereo for ambient sound and live music.If my son keeps making films we might get a second one. Also I needed help getting the 10 year warranty and the Azden folks were very nice and patient.I know B&H is a big, big business but when I call with questions I feel like I'm talking to a tech buddy. Thanks for that. Rated 5 out of 5 by Pete RD from all-in-one answer for run-n-gun video recording. The Nikon D500 can shoot 4K video and record audio in stereo, but that sound is nowhere near the video quality. Azden SMX-30 does a very good job recording mono and stereo from a point source or surround from roaring waterfall to a gentle rain in the forest. Super easy to switch between mono and stereo as you need and having the mike(s) turn on or off with the camera is very convenient and worry-free. The mike cover and optional dead cat help control wind/ambient noise conditions. are you able to tilt the microphone up or down at all? It doesn't tilt by itself, just a straight-ahead shock mount. But you could add a small Vello ball head to change it's positioning as long as your rig/setup has the headroom. Can you use with a Sony FS100 with XLR input and will track be stereo when selected? Which mini to XLR adaptor? The SMX-30 will put out the identical signal on the tip and ring when it's in mono mode so that you can feed the same signal to left and right inputs of your camcorder. I don't know the Sony FS100, but I'll assume it has a pair of female XLR sockets for left and right rather than a stereo 3.5mm socket. I have a Canon camcorder with XLR inputs, and what I use is a cable made by Hosa with a 3.5mm mini plug on one end and a pair of male XLR connectors on the other end. I can't find the model number on the Hosa site, but there other manufacturers of such cables. Search B&amp;H or other vendor web sites for such cables. Since the SMX-30 also has a stereo mini plug, you'll also need to buy an adapter to connect two male mini plugs together (unless you can find a cable with the female mini stereo socket and pair of male XLR connectors). does it has background Hiss sound , when compared to rode video mic pro or plus ? I have not heard any background hiss with this unit. Does this work worh D750? Hello Darren. Thank you for your inquiry in regards to the SMX-30 Stereo/Mono Switchable Video Microphone. Yes, the SMX-30 is perfect for the Nikon D750. That particular DSLR is meant for filmmaking, including a 3.5mm mic jack and a headphone jack for monitoring as well. Make sure to go into the audio settings of the D750 and switch over to MANUAL mode to adjust your levels as desired depending on your application and the mic's output level. Is the SMX 30 comparable in sound to the Rode Vidpro stereo? Is there adequate base? Hello. Thank you for your inquiry in regards to the SMX-30 Stereo/Mono Switchable Video Microphone. To answer your question, yes. There is most certainly adequate bass response with the SMX-30. The frequency response goes down to 40Hz, giving you plenty of bass in a stereo recording. Also, please remember you also have the functionality of a Mono shotgun mic included in this product with the simple flip of a switch! Will it work on the Sony nex 7? Hi as long as your Sony nex 7 camara has a mini jack audio input slot on your camara it will work excellent with your camera plus you can switch from stereo to mono input and roll off bass frequency as well, you can also have -10 &amp; -20 decibals from the mic excellent feature if your recording a parade or noisy concert event. The audio quality is fantastic and it's more an directional microphone. In the promotional video by Matt from Azden, is he using the Azden SMX-30 in the vid and which mode: stereo or mono? Thanks for your help. Did he give any hints or have you been listening carefully to it? Is this microphone good for recording a symphony orchestra concert? i.e. is it good at picking up a decent range of frequency from the deepest of basses to the highest pitch of a piccolo?